...(not the real one, sorry!) to cuddle all winter, and the details about how to enter are included in the newsletter. If you aren't on my email newsletter list yet, follow this link to SignUpNow ! A Filly in Your Stocking? Just wanted to let you know that FARAWAY FILLY's release date is Dec. 23, but because of the holiday busy -ness, lots of stores won't be taking special orders after today. Of course you can still reserve a copy online. Not pushing books, here, but I just don't want you to be disappointed if you're expecting a filly in your stocking! Tune in on December 1st for the Today Show story about our wild horses which will include Cloud and his beautiful family. Kerry Sanders, the correspondent who filmed with me last July, said it should run at about 9 a.m. EST, but that is not a given, so stay tuned if you don’t see it exactly then. Kerry is a big fan of the mustangs but tried to create a balanced look at the problems facing America’s mustangs. You are very near the top of things I'm thankful for, so I'm sharing my favorite Thanksgiving sight from early this morning -- the horses reacting with surprised delight when all the apple trimmings from the pies we're making were sprinkled over their feed! They were so cute. For a minute they forgot to be greedy. And that's a good example to us all, don't you think? Roaming the hills of the Nevada range. Runnin' over long prairies and splashin' through small rivers. If they ever catch me and take me into one of their small corrals. And they'll break my heart. They'll expect from me to carry heavy saddles and people. They'll ride me and let me go after cattle. And they'll gimme a home. The home I long for and the home I belong to. They'll never gimme the wildness back. - the dream of a world only made for wild horses. Laura is one of my long-time readers. She's fourteen and lives in Germany. I thought you'd enjoy this wild horse poem from someone whose heart is with the horses, though she lives halfway around the world from them. Have you seen these covers of mine? Where do you think they're published? If you're as surrounded by money worries as lots of people (kids and adults), you may be looking for gift ideas that are cool, but don't cost much. Or anything! 1. A long time ago, I gave a friend a ring which had been given to me by an old boyfriend. Because it had lost its sentimental value, I'd been keeping it in a drawer, but she was DELIGHTED! If one of your siblings or friends really loves something of yours that you only sort of like (book, tshirt, poster) think about wrapping it nicely for a gift. 2. If you know someone who LOVES her dog or cat, think about making pet treats. They could be toys or cookies. Search the Internet for recipes or toy designs. 3. BOOK X 2 -- Here's how to give a double present! Let's say your mother loves to read mysteries and likes to cook. Cruise your local bookstore or the Internet for books which include recipes as well as stories. I'm going to suggest the Coffee House mystery series for three reasons. One, they're great books (I just read ESPRESSO SHOT, the newest one and loved it); I always learn something more about cooking and coffee (though you might not want to know the details about ONE exotic coffee bean...); the books are written by a fantastic team of writers, one of whom (when she was an editor with a NY publisher) bought my first ever book. So, you know she has good taste? and go to Cleo's website at here and enter a contest, too. Hmmm...that would triple the present if you won. I just stumbled across this website and had to share it with you. Check out http://madeleinepickens.com/" and you can click on the video from the TV news story on her & the plan to save horses BLM had slated for slaughter. I know some of you haven't been with me since I started my blog and even some of you who HAVE been along for the ride may have forgotten that the name of my blog is WABI SABI WEST. Way over-simplified, it's an appreciation for the beauty of things which are imperfect, incomplete, impermanent, humble or rustic. Wabi Sabi is a Japanese concept and Wabi Sabi West is a celebration of how the idea touches my life with my readers. Wabi Sabi can mean "to everything there is a season". It can mean fitting yourself to Nature rather than exerting power over it. There may be as many interpretations of Wabi Sabi as there are people who've felt it. If you'd like a few examples, read on. I bet you've guessed that this little baby garden in the hitching post is an example of Wabi Sabi to me. I'd love to know some of YOUR examples, too. There's a shot of me in the audience, but it goes past fast -- too quick to catch the glitter of my horse bracelet's blue eyes! WILD HORSES NOT ASKING FOR A BAIL OUT, JUST A JAIL BREAK! Nothing's definite yet, but Mrs. Pickens has the heart and the means to save wild horses and it looks as if BLM will cooperate with her!!! DALLAS — The wife of Texas oil tycoon T. Boone Pickens said Tuesday she'll create a refuge for wild horses, after the federal agency that manages the animals said it may have to kill some to control the herds and protect the Western range. About 33,000 wild horses and burros roam the open range in 10 Western states. The U.S. Bureau of Land Management wants that population to be about 27,000, in order to protect the herd, the range and other foraging animals. 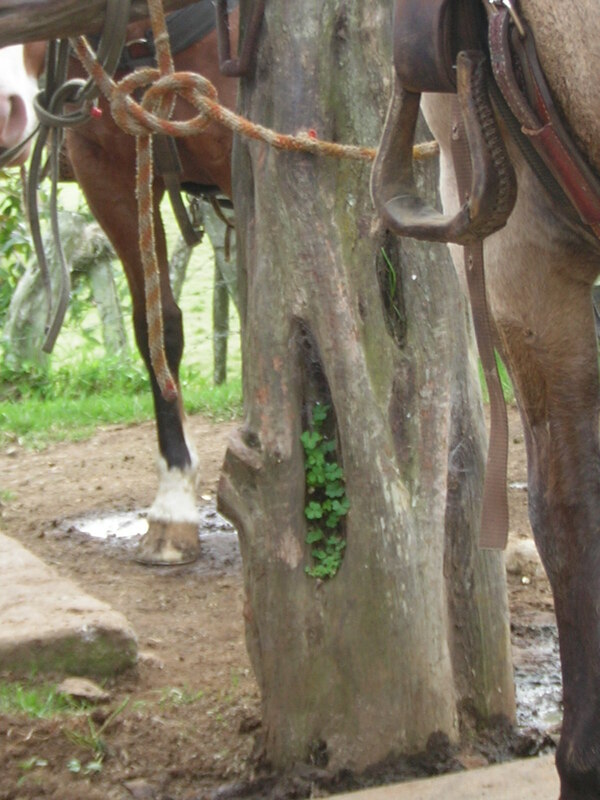 Those horses that are too old or are unadoptable by the public are sent to long-term holding facilities. The BLM now has about the same number of the animals in holding facilities as on the range. The agency has said the costs of keeping animals in the holding facilities has caused officials to consider euthanasia as a last-resort. Madeleine Pickens told The Associated Press that she has proposed purchasing around 1 million acres to be a refuge for the horses now in holding facilities and that the BLM has agreed to give her the horses once she has the land. BLM spokesman Tom Gorey said the agency welcomes the offer. "Right now we couldn't be more pleased with her interest, and we hope that materializes so that we can get many of these horses out of holding," he said. The slaughter is "on hold" for now. My brain is fried, but I knew you'd want to know what happened at the meeting today. 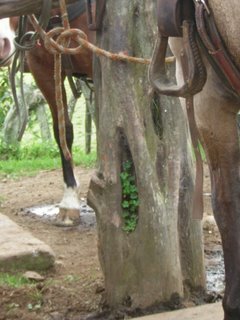 First, you need to know that the horses have many friends and they were there to stand up for what they believe. Next, the board we all spoke to was one made up of a panel of people with interest in the horses, coming from different directions. For example, cattlemen, hunter, vet, humane advocate, etc.After listening to all of the public comments and reports from the Federal government, they will make a recommendation to the BLM. The Director of the BLM, Henri Bisson, gave a brief talk saying that he didn't want his legacy (he's retiring soon) to be acting too quickly to do something he'd regret. He said that a decision wouldn't be made today, or next week. Many people are in favor of the contraception program, which would reduce the herd more slowly than killing the horses, but obviously more humanely. The very best testimony of the day, in my opinion, was given by Cindy MacDonald of American Herds. She's promised to let me reprint it! As for my presentation, you know what happened...I had lots more to say that would fit in three minutes. If you haven't already explored this great website, I hope you will. Please send me your good thoughts and prayers today. A lot of lives are at stake. For those of you worldwide who want to keep an eye on what BLM does with our wild horses, here's your chance! This very controversial meeting, brings together the BLM, The National Wild Horse and Burro & Advisory Board and Wild Horse and Burro Advocates. The decisions made at this meeting, could include the euthanasia of over 30,000 Wild Horses and Burros. I'll be lined up for a public hearing at 8 a.m (Pacific Time) Monday, along with many other wild horse advocates. I will speak for you and the horses, if I'm allowed to do it. I've heard that these meeting are often started with many hours of government discussion before public comment period is opened. I'll stay all day, until they let me speak or ask me to leave. Please feel free to send a copy of this to anyone who cares. p.s. I just found an agenda for tomorrow and I wish I could say I were surprised that BLM has left a single hour for public comment. I hope they'll change their minds, since they say it is a TENTATIVE agenda. ADDRESSES: The Advisory Board will meet in Reno, Nevada at the Silver Legacy Resort Casino, in the Reno Ballroom, 50 East Fourth Street, Reno, Nevada 89501. The Silver Legacy's address is 407 North Virginia Street, Reno, Nevada 89501. Their phone number is 1-800-687-7733. 8 a.m. Call to Order & Introductions. Approval of June 2008 Minutes. BLM Response to Advisory Board Recommendations. BOOK SIGNINGS -- wish you were here! 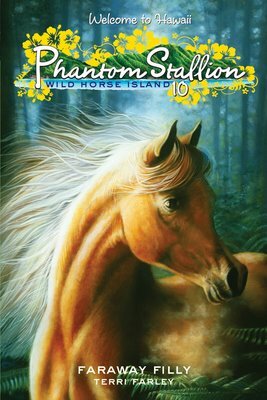 Terri Farley, author of the Phantom Stallion Series, will sign her books alongside some furry friends. Dogs from the Nevada Humane Society will help out Terri with her signing, and a portion of the proceeds from this event will go to the NHS. Sheryl Crow adopted a mustang and now she's standing up for their protection. I loved this interview with her, because she's not buying BLM's excuses, but she says so in an intelligent and thoughtful way. Also, there's news that you may be able to watch Monday's meeting LIVE. I'll tell you how, soon! Want to Vote on these slogans? A few days ago, I told you about a group of people who are asking the American Quarter Horse Association to stop their support of horse slaughter. As one of their tools, they are looking for a good, catchy slogan. 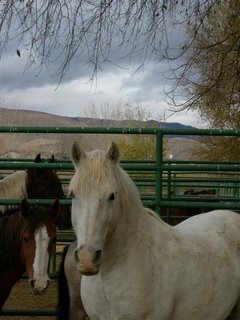 Right now, the real Phantom and his mate Shy are begging you to help save their Western family of wild horses! BLM is ready to dispose of 33,000 captive wild horses through sale to killer-buyers or "euthanasia." I hate to use their word for slaughter, because it's Greek for GOOD DEATH. 3. include YOUR name and address (or that of your parents) in the body of the message. Next, write to our new President. His two little girls NEED to see mustangs running free! YOU CAN DO THIS, EVEN IF YOU MISS THE NOVEMBER 12th deadline! If you haven't already seen the news, you will. BLM is back stronger than ever saying they can't afford to feed the horses in captivity. Like you, I just want to yell that they've mismanaged the wild horses for a generation and gotten themselves in this position, but we need to suggest solutions, so start thinking. Put the horses back on the range. Do some feed drops when the weather warrants it, and it would still be much less expensive than spending millions on round-ups and renting corrals, etc. Would this mean the horses would live shorter lives? That's likely, but they'd be free. Keep some mustangs in large sanctuaries where visitors could see them from viewing decks, on tours, etc. and they would earn their keep. I hope to be speaking next Monday and I will give you a place to email your ideas this week. This past weekend I was awarded a Silver Pen award for a letter calling on the BLM not to make wild horses balance the BLM budget with their lives. BLM is having a meeting NEXT MONDAY on this life or death decision. Sorry I forgot to provide links to my Facebook & MySpace pages. 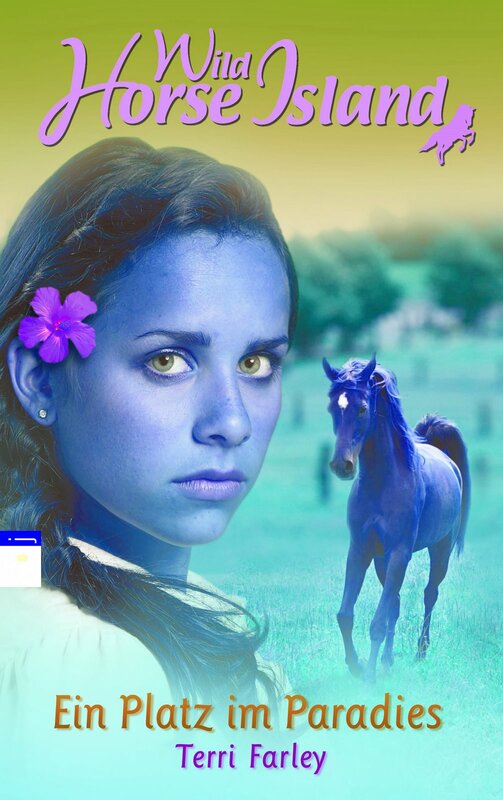 You'll find lots of horsey & bookish folks there! If you go visit, please leave me a message!! I'm so excited to share this with you!!!! 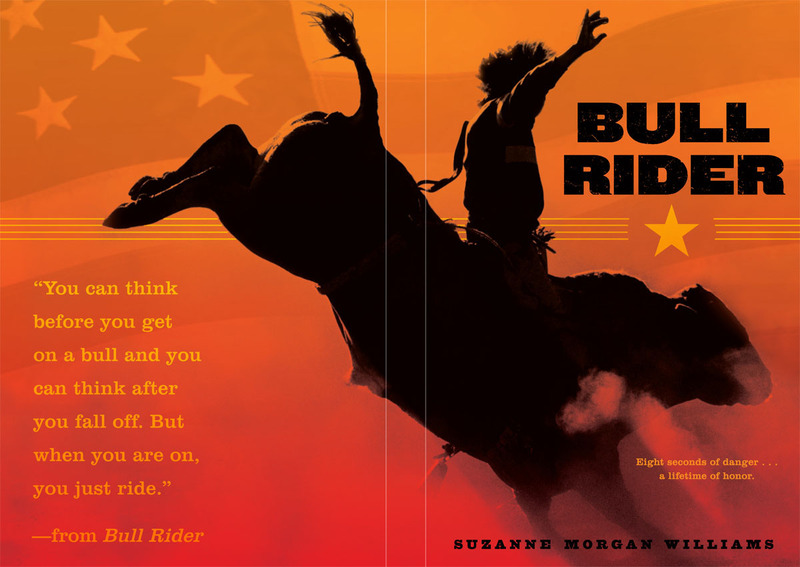 My friend Suzy -- known to the publishing world as Suzanne Morgan Williams -- has an amazing book coming out in February and I get to give you a preview of the cover. 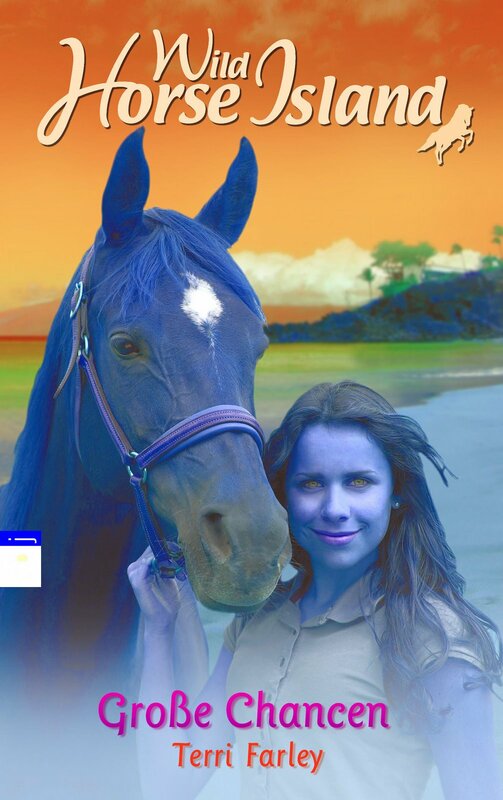 This story takes place on a ranch in Salt Lick, Nevada. To tell you the truth, I think the main character might find a place in your heart right next to another young Nevada cowboy. FACEBOOK & MYSPACE & Favor? First, I hope you'll send me good vibes for the benefit booksigning I'm doing today...for the Nevada Women's History project. I'm trying to get better acquainted with Facebook and MySpace as my readers keeping asking me to do! I just had to share a photo of a beautiful paint filly. 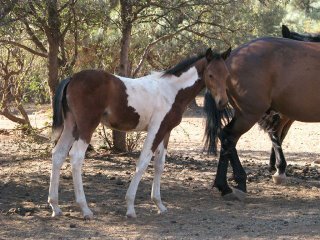 She was supposed to be adopted on adoption day at the Wild Horse Sanctuar (home of the real Phantom) but it didn't happen :( abd now she's looking for a home. Horse: It's NOT for Dinner! 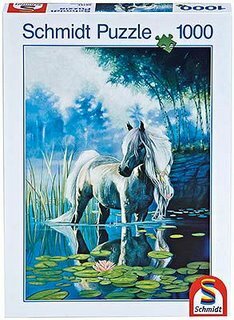 The National Horse Protection League needs your help to tell people who support horse slaughter why it's wrong. I've posted their sample as my title, but I know you all have some super creative minds!!! If you have a short phrase you think might work, send it to info@horse-protection.org, with the phrase in the subject line, by midnight on Sunday (11/9). We will pick our favorite and incorporate it into our action in a couple of weeks. So put your thinking cap on. We look forward to seeing your phrases and will keep you posted about the progress of this campaign. I simply love it when OTHER people comprehend the wonder of wild horses. You know that it's not only the Western U.S.'s mustangs which have been killed by human greed. Australia's brumbies have suffered, too. That's why I was so pleased by this story about international interest in wild horses for endurance riding. I just heard from my reader Laura in Germany and look what she found in a media catalog! It's a puzzle of the art for WATER LILY. I guess the artist thought it was as beautiful as I did! I'll be answering your comments and emails, and you can't know how much I love hearing from you!!!! I've received email about Special Edition campaignsm too. In more important news, BLM is having a big meeting about the West's wild horses and the "solution" of slaughtering mustangs to save money. The meeting will be held in Reno, Nevada, near my home, in mid-November. I'm going to apply to speak and I'd love to be your voice (and the voice of your teachers, parents and friends). I'll be accepting letters on what wild horses mean to America on my blog and via email beginning Nov. 5th. No matter which direction my career turns, I'll never stop fighting for the horses. 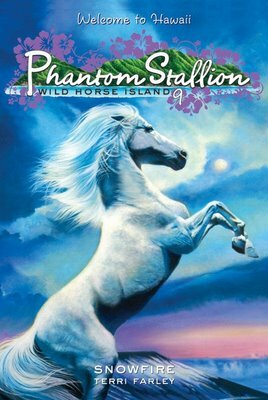 According to my email, lots of you are wondering why you can't find another WILD HORSE ISLAND title after GALLOPING GOLD, book 11. For business reasons, GALLOPING GOLD will be the last WILD HORSE ISLAND book. Those of you who've just started reading my books, never fear! Counting the original PHANTOM series & WHI, there are 35 of them, so you have lots of reading ahead of you! To you great long-time readers who've ridden along with Sam & Darby & me -- THANK YOU! I promise to keep writing my newsletter, blog and Sam's blog! And, since my writing is heading off in an exciting new direction, I also promise to keep you posted on where I'll pop up next!